"Included in the Lord's Prayer is the petition 'Give us this day our daily bread' (Matthew 6:11) or 'Give us day by day our daily bread' (Luke 11:3). I believe that we would all readily acknowledge that we have needs each day that we want our Heavenly Father's help in dealing with. For some, on some days, it is quite literally bread—that is, the food needed to sustain life that day. It could also be spiritual and physical strength to deal with one more day of chronic illness or a painfully slow rehabilitation. In other cases it may be less tangible needs, such as things related to one's obligations or activities in that day—teaching a lesson or taking a test, for example. "The Lord's invitation to seek our daily bread at our Heavenly Father's hand speaks of a loving God, aware of even the small, daily needs of His children and anxious to assist them, one by one. He is saying that we can ask in faith of that Being 'that giveth to all men liberally, and upbraideth not; and it shall be given' (James 1:5). That is, of course, tremendously reassuring, but there is something at work here that is more significant than just help in getting by day to day. As we seek and receive divine bread daily, our faith and trust in God and His Son grow." I've always appreciated the subtle difference between the Lord's prayer as shared by Matthew and Luke. While Matthew recorded "Give us this day our daily bread" (the more familiar rendition), the Luke account seems to expand and emphasize the ongoing blessing implied in the petition by saying, "Give us day by day our daily bread." Not only are we asking for God's help each day, one at a time, but also with the awareness that His help is available to us each and every day as we continue to petition in faith. Elder Christofferson points out the help we ask for sometimes is "quite literally bread" as we may struggle to survive physically in the world. But at other times, it is "physical and spiritual strength" as we confront the challenges of life, or other more immediate and personal needs. But the key is that we can, we must, ask today for the needs of today. I am grateful for this reminder. 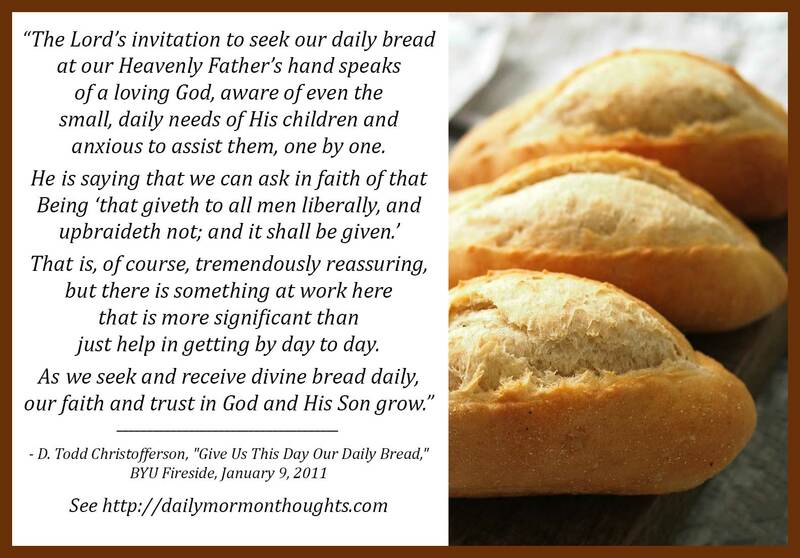 The blessing and power of asking for "daily bread" is not just in getting the bread to help survive each day. It's also in developing and strengthening personal trust and faith in Jesus Christ and in the Father. 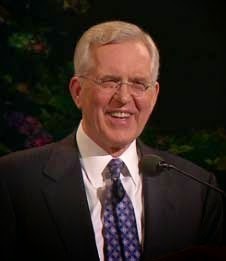 As we learn to turn to Them in confidence, we will be blessed with ever-growing faith and hope.